THESE BEAUTIFUL BAGS MAKE A WONDERFUL GIFT FOR ANY BRIDE TO BE. 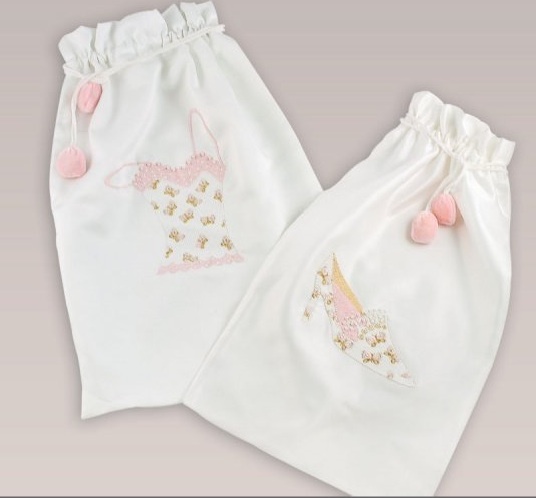 STUFF THEM WITH ANY OF OUR "BRIDAL UNDERGARMENTS" TO ADD A SPECIAL TOUCH TO YOUR GIFT. THESE BAGS WILL SHIP OUT WITHIN THREE DAYS FROM DATE ORDERED. ALL PERSONALIZED AND MONOGRAMMED ITEMS ARE FINALE SALE.